Los Angeles (AP) – More than two decades after Robin Williams conquered that pesky board game, “Jumanji” has been resurrected with more and glossier stars (Dwayne Johnson, Kevin Hart and Jack Black), a comedy director and a “modern” twist. The result, “Jumanji: Welcome to the Jungle ,” is a very sweet, and generally entertaining body swap lark with some nice messages about being, and believing in, yourself. Why it had to be “Jumanji” is the head-scratcher. 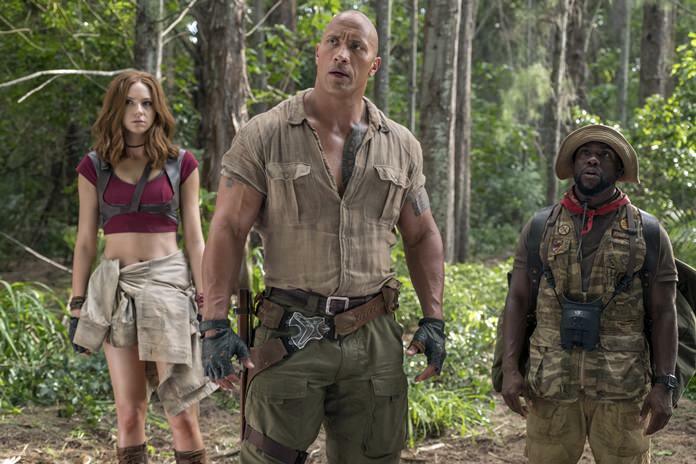 Even speaking as someone who was 12 when the first one came out, and genuinely enjoyed the Joe Johnston-directed adventure and the fantasy of being swept up in a board game come to life, the idea that a die-hard “Jumanji” fanbase exists, or that the “brand” is so rock-solid that it needs a reboot, seems dubious at best. There are pointless sequels everywhere of course, and questioning the purpose for their existence is a fruitless exercise. The only reason I bring it up here is because Jake Kasdan’s “Welcome to the Jungle” spends a fair amount of genuinely unnecessary time straining to justify how it is connected to “Jumanji” including a whole prologue establishing how it had evolved into a video game by 1996. The concept here is that when you’re transported into the game, you are suddenly a character in the game, in body, voice and skillset but with your earthbound personality pretty much intact. This is how a group of mismatched teens sharing the same detention, including the nerdy, shy Spencer (Alex Wolff), the football player Fridge (Ser’Darius Blain), the superficial popular girl Bethany (Madison Iseman) and the too-smart for gym class Martha (Morgan Turner), transform into avatars played by Dwayne Johnson (Spencer), Kevin Hart (Fridge), Jack Black (Bethany) and Karen Gillan (Martha). It’s a role reversal for everyone — the nerdy girl is hot now (and scantily clad), the hot girl is a soft, middle aged man, the skinny guy is The Rock and the big football player is now tiny and wimpy — and they all have to go through the stages of learning to accept their new bodies, talents and shortcomings. How can you argue with a bunch of movie stars acting goofy and hawking a “believe in yourself” message? There are some odd beats and choices, especially around Gillan’s Martha, who is costumed in nearly nothing (surely as a send up of what female characters usually wear in video games, but however meta it might have been intended to be, it is still literally her costume). There’s also a plot line that hinges on her learning how to flirt from Bethany (because they all decide that flirting with the bad guy security guards is the only way they can get past them). Maybe it’s all in good fun, or maybe one of the four credited screenwriters could have been a woman. But “Jumanji: Welcome to the Jungle” probably doesn’t warrant that much scrutiny. Its surface pleasures are strong enough for a fun holiday afternoon at the movies. “Jumanji: Welcome to the Jungle,” a Sony Pictures release, is rated PG-13 by the Motion Picture Association of America for “adventure action, suggestive content and some language.” Running time: 119 minutes. Two and a half stars out of four.